60mph in 5.2 seconds and hit a top speed of 182mph. 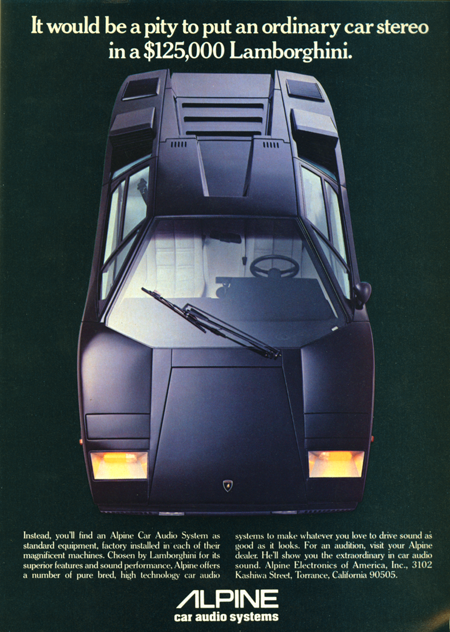 The completely original, 5-speed manual transmission matching numbers car was in the hands of its first owner for 27 years and has still only covered a fraction under 10,000 miles, making it probably one of the most original, low-mileage examples of the Countach QV in existence. 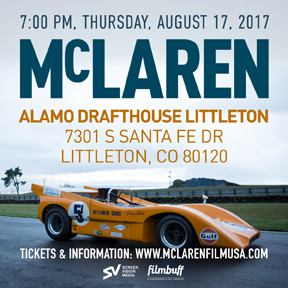 Screenvision Media, in partnership with Gunpowder & Sky, today announced a one night only screening event in dozens of U.S. cities for McLaren, the captivating story of Bruce McLaren, the legendary racing champion, designer, engineer and founder of the iconic supercar that bears his name. Theater information and tickets can be found at https://www.mclarenfilmusa.com with additional locations added daily. The name McLaren is synonymous with motor racing excellence, and stands today as a symbol for automotive superiority. Yet what is less known is the brand’s origins. McLaren recounts the New Zealander’s life, from his humble beginnings at his father’s auto shop in Auckland, to revolutionizing Formula One racing by becoming the youngest driver ever to win a Grand Prix, to his death at 32. Featuring interviews from his closest friends and family members, the documentary is an unprecedented window into the life of a true genius. The Oldsmobile Toronado was a unique, a front-wheel drive coupe introduced by the Oldsmobile division of General Motors in 1966. At the time, it was the largest and most powerful front-wheel-drive car ever produced, and one of the first modern front-wheel-drive cars equipped with an automatic transmission. Designed to compete with the Ford Thunderbird and GM’s own Buick Riviera, the original 1966 model Toronado was powered by a 425 CID Super Rocket V8 engine rated at 385bhp, mated to a three-speed Turbo Hydra-Matic transmission. In 1966 the Toronado was voted the Motor Trend magazine ‘Car of the year’. The Toronado also placed third in the 1966 European Car of the Year contest, a distinction no other American car had achieved before. The unusual Toronado powertrain, which combined an engine and transmission into an engine bay no larger than a conventional rear-wheel drive car, was dubbed the Unitized Power Package (UPP) and was used basically unchanged in the 1970s GMC motorhome. The Toronado was GM’s first subframe automobile, which means it was partly unitized, and used a subframe that ended at the forward end of the rear suspension leaf springs, serving as an attachment point for the springs. It carried the powertrain, front suspension and floorpan, allowing greater isolation of road and engine harshness. In 1969 Frank Peterson of Lakewood Colorado took a stock 1968 model Toronado and built the car you see here to run in the Pikes Peak Hillclimb. 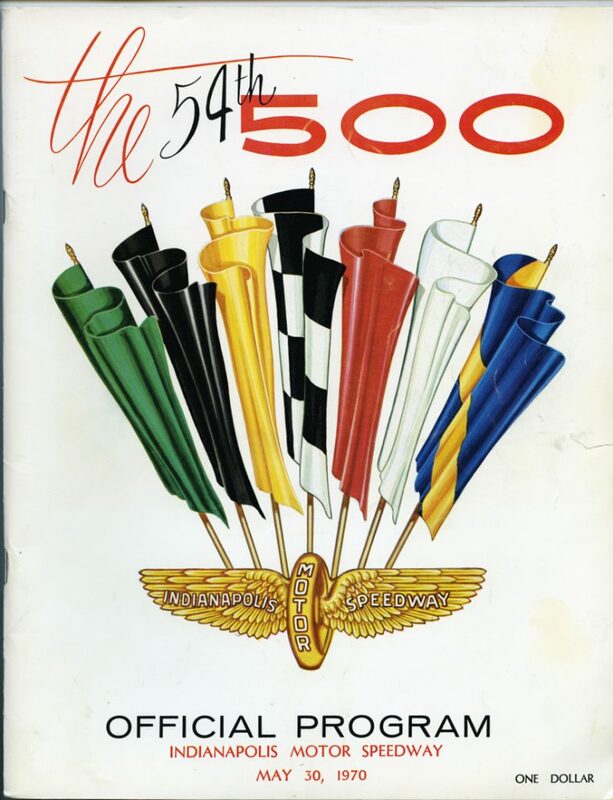 Frank was already a regular at the “Race to the Clouds”, one of America’s greatest races, where the course begins at just over 9,000 feet, and finishes at the 14,110-foot summit, and climbs to an altitude that leaves any car’s engines gasping for breath. In the mid-1960s Frank and Kaye began a long and fruitful partnership with Oldsmobile. The Toronado looked like a natural for the mountain, with its grippy front-wheel-drive layout and monster motor. 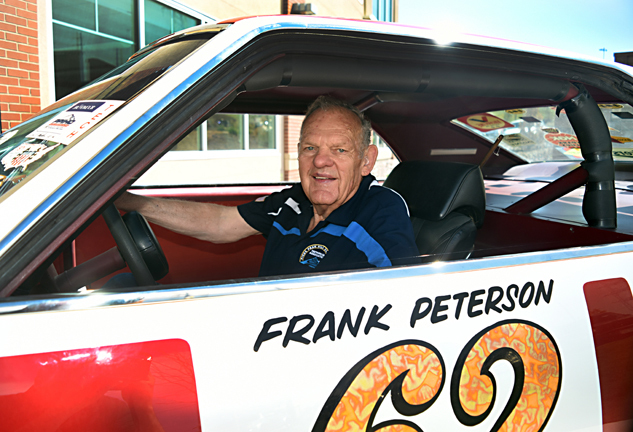 For Frank, it was a pipeline into the factory that boosted him into the top tier of competitors. 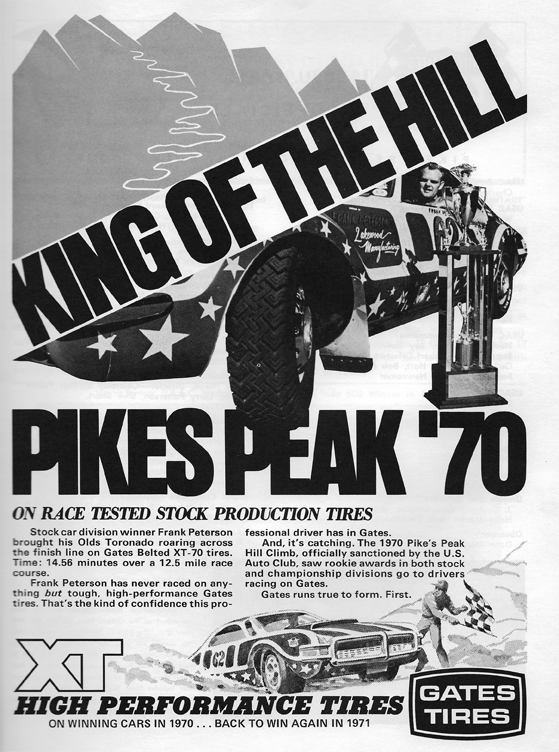 Frank built two Toronados for Pikes Peak in 1966, and in 1967 finished second after running out of gas in the last mile. In 1968, Frank had a hand in Toronados that finished 1-2-3. And then there was our feature car, a highly developed ’69 model Toronado, that ran in the 1969 (second in class for Frank), ’70 and ’71 Hillclimbs, including a famous class win in the Stock car division for Frank in 1970. 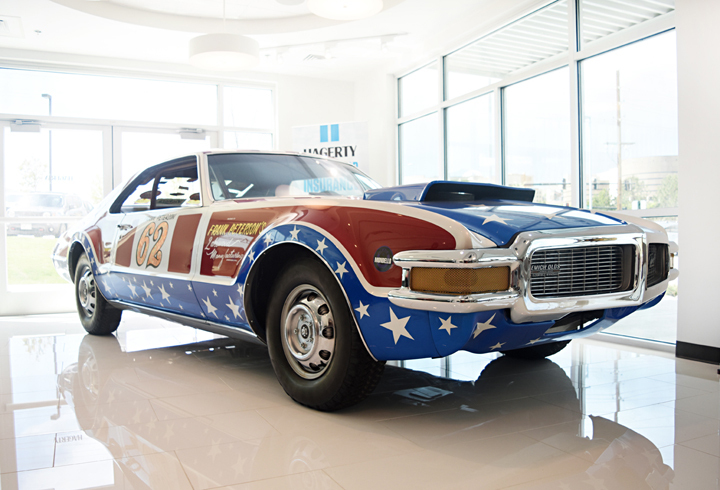 After the Toronado was retired in 1971, it went into storage for several decades while Frank continued racing other Oldsmobiles. Still owned by Frank and Kaye, in 2009 it emerged to be given fresh paint and stripes by Gary Riley and Marvin Galbraith from Level One Restoration. The distinctive lettering was recreated by Joe Broxterman of Speedway Graphics in Denver. Remarkably, the engine started and ran with no drama. 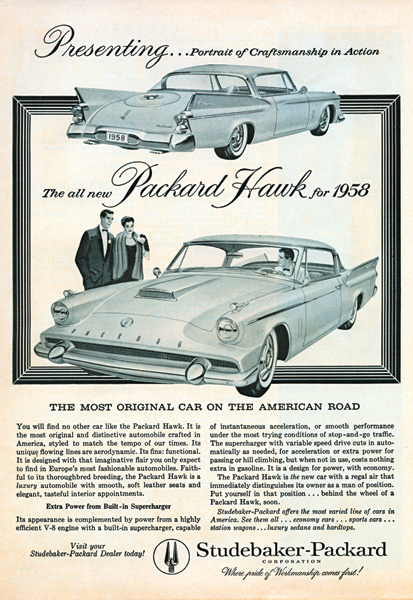 The Packard Hawk was the sportiest of the four Packard-badged Studebakers produced in 1958, the final year of Packard production. In 1956, the Studebaker-Packard company was in financial trouble and the Curtiss Wright Corporation was put in charge of management. Everything was consolidated to the Studebaker plants in South Bend, Indiana. The 1957-1958 Packard models were essentially rebadged and retrimmed Studebakers. With a top speed of 125mph, the fastest Packard ever built, the 1958 Hawk was constructed around the 1957 Studebaker Golden Hawk 400, with a re-styled fiberglass front hood and nose, bonded to the stock steel fenders. Instead of the Studebaker Hawk’s upright Mercedes-style grille, the Packard Hawk had a wide, low opening just above the front bumper covering the whole width of the car. Above this, a smoothly sloping nose, and hood—reminiscent of the 1953 Studebakers, but with a bulge as on the Golden Hawk—accommodated the engine’s McCulloch supercharger that gave the Studebaker 289in (4,700cc) V8 a total of 275bhp. At the rear, the sides of the fins were coated in metallized PET (Mylar) film, giving them a shiny metallic gold appearance and a fake spare-tire cover adorned the 1953-style, Studebaker deck lid.Widely spaced PACKARD lettering appeared across the lower section of the nose, and a gold Packard emblem in script—along with a Hawk badge—on the trunk lid and enormous tailfins. The interior was fully equipped with a striking leather design, and a full compliment of instruments was installed in an turned-aluminum dash. A swept-spoke Packard-branded wheel was also fitted. As on early aircraft and custom boats, padded armrests were mounted outside the windows, a rare touch. The styling which was definitely controversial, and often described as ‘vacuum-cleaner’ or ‘catfish’ by detractors has come to be appreciated much more today, than on its debut. Only 588 examples of the 1958 Hawk were built, with Packard’s impending demise a likely contributing factor, rather than a lack of interest from the buying public. Most examples were equipped with the Borg-Warner three-speed automatic transmission, but something approaching 28 cars were produced with the B-WT85 3-speed w/overdrive manual transmission. Studebaker-Packard was the first manufacturer to popularize the limited slip differential, which they termed Twin-Traction, and most Packard Hawks came with TT. It was certainly the fastest Packard ever sold, since it shared the majority of its components with Studebaker’s Golden Hawk. The list price with taxes and delivery was $3995, about $700 higher than the Studebaker model, but certainly value for money considering the more luxurious interior. 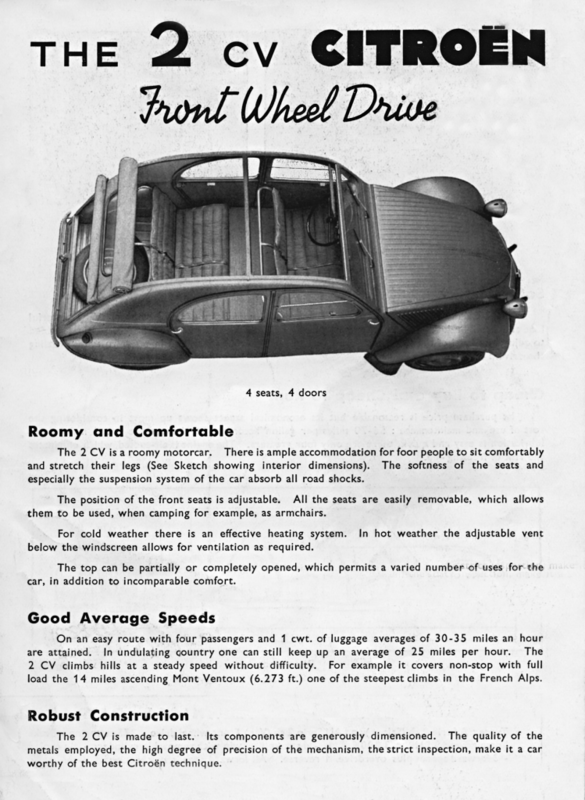 Electric window-lifts and power seats (fitted on the car you see here) were optional extras. Its rarity and status as the best-regarded of the ‘Packardbaker’ final-year cars have in recent years certainly made the Packard Hawk a highly sought after collectible classic. Values are roughly double those of the equivalent Studebaker, and because a Studebaker drivetrain was used, the mechanical parts needed to keep a Hawk on the road are more readily available. The Hawk is now a realistic car to put serious money into a restoration, and without doubt, is a unique car, worthy of a place in any significant collection of 50s vehicles. 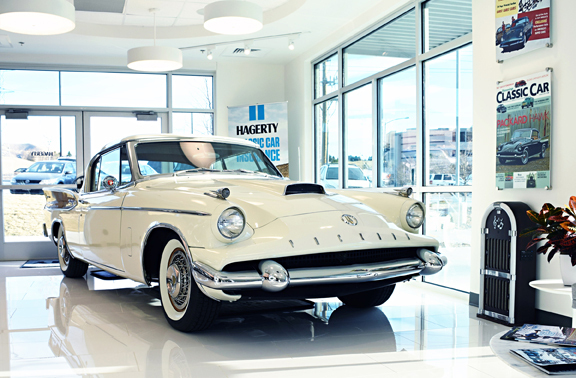 The stunning 1958 Packard Hawk on display here is owned by Carey and Peggy Dietz of Arvada, Colorado. They have been caretakers of the car since 2007 when Carey’s father, who had owned the car since late 2000 decided it was too much of a responsibility for him to drive his “Baby” any more. 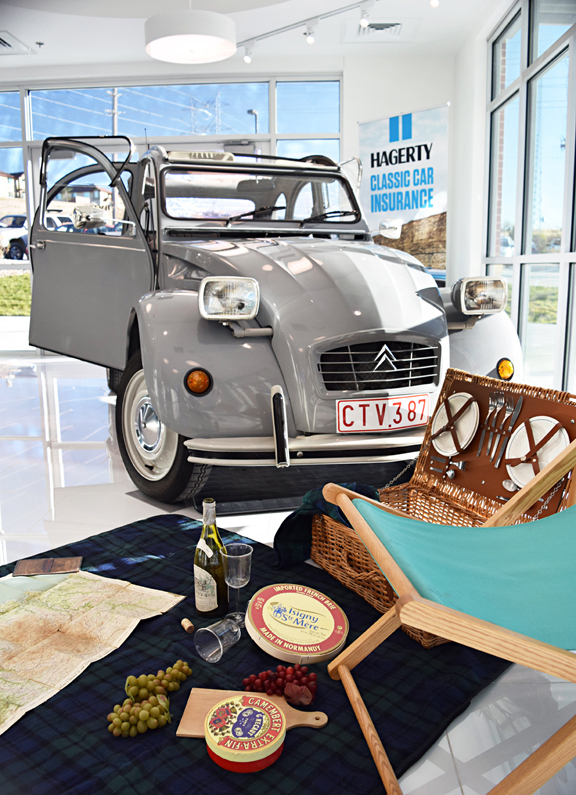 Carey tells us the story of how his father came to own such an unusual car. “Back in 1982 my roommate showed me a magazine called Car Collector and Car Classics that featured a beautiful Packard Caribbean Classic on the cover. An eternal optimist, he went on to tell me “That’s what my car is going to look like when it is done.” Considering his car had rust holes everywhere I was somewhat skeptical to say the least. Well he did do it, eventually, and it really is beautiful! Moving forward to 2000, my father called me and told me he was looking for a classic car to keep at his Florida residence for 6-months a year, and, since Packard had always been his favorite car, that is what he wanted. I pictured him driving a stylish 1930s open car, but before you knew it he had bought the one-owner Hawk from a widow in Las Vegas! The partly restored car needed to be painted and have the chrome re-fitted, but needed little else to bring it up to the sleek, stylish, show standard car you see here. On a visit to Denver my dad happened to stop in an antique store and find a copy of that very same magazine. It features a Packard Hawk on page 19! Watching the Daytona 500 last weekend got us thinking about past Daytona 500 races and some of the stars of the day that we have forgotten. 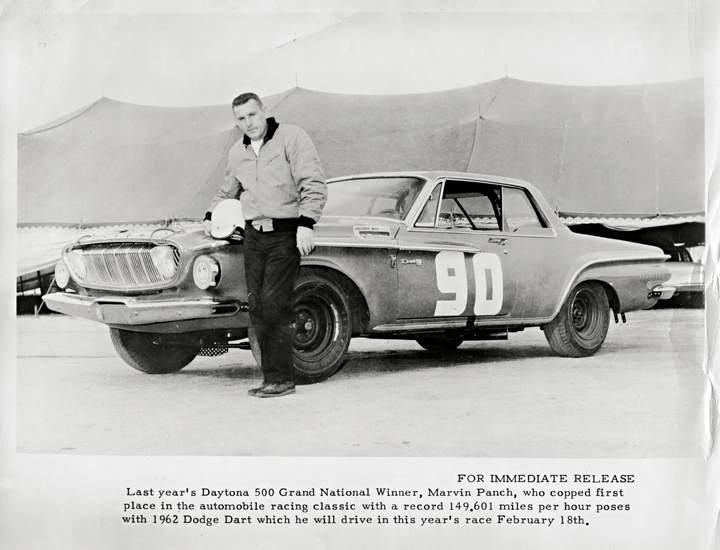 A delve into the archive produced this image of NASCAR legend Marvin Panch alongside a rather ‘stock’ looking Pontiac. It was normal MG practice to destroy racing prototypes after retiring them, but in 1960 John Thornley managed to dispatch EX186 to US dealer Kjell Qvale, invoiced as “auto parts.” Qvale kept EX186 stored until 1966, after which it was sold and driven on public roads for about a year until its engine required overhaul. At that time, overhaul costs were prohibitive and the car was removed from service, parted from its engine, and stored in a barn on a walnut farm in Red Bluff, CA. Luckily, most of the car including the hand-built aluminum body and unique DeDion rear suspension survived virtually intact and, in 1982, having seen it advertised in Road & Track magazine, MG enthusiasts Joe and Cathy Gunderson and Steve Willis of Denver, Colorado, purchased the car. Since then, they have carefully and painstakingly restored it to the virtually original specification you see here. Tracking down missing original parts such as the gearbox has been one of the special challenges of the unique 30+ year restoration of EX186 which is currently on display at the Hagerty offices in Golden, Colorado. Introduced to replace the 275 GTB/4, the Ferrari 365 GTB/4, two-seat grand tourer was, like so many new Ferrari models of the period, revealed to a surprised public at the 1968 Paris Auto Salon. The sleek and stylish Pininfarina designed front-engined car featured a heavily revised version of the Colombo-designed V12 power-unit fromthe 275 GTB/4model, bored out to 4.4-litres (4,390cc), and was the only production Ferrari at that time use a high-performance dry-sump lubrication system on its engine. Although a Pininfarina design, as with many previous Ferrari road cars styled by Leonardo Fioravanti, the new 365 GTB/4 was radically different to the model it replaced.Many people felt that its sharp-edged styling resembled a Lamborghini rather than a traditional Pininfarina Ferrari. 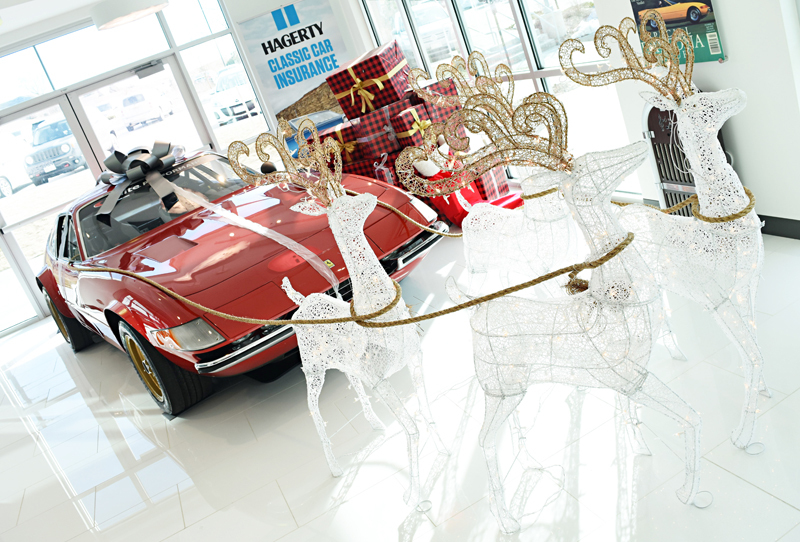 The Ferrari 365 GTB/4, is more commonly know to most people as the Ferrari Daytona. 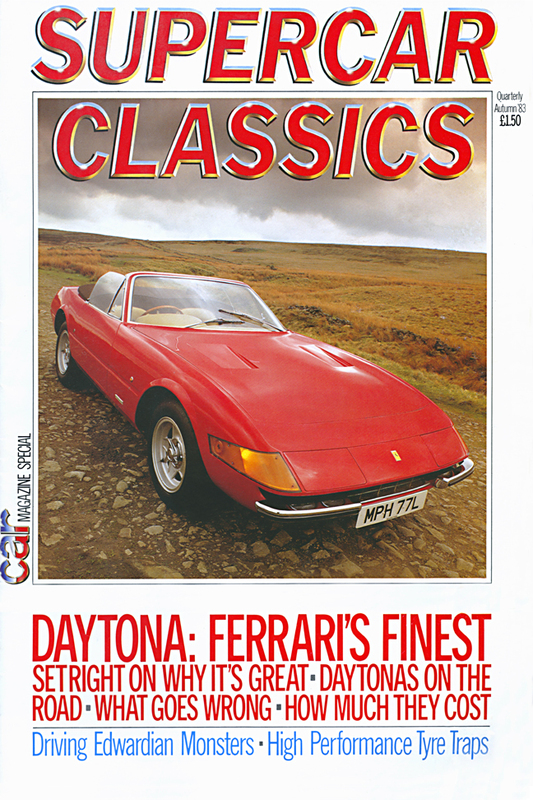 This unofficial name is reported to have been applied by the media rather than Ferrari themselves, and was reputedly named to commemorate a Ferrari 1-2-3 finish in the February 1967 24-Hours of Daytona. The unofficial name was quickly adopted by everyone and continues to be widely used today, however, to this day, Ferrari itself only rarely refers to the 365 GTB/4 as the “Daytona”. Unlike Lamborghini’s then-new, mid-engined Miura, the Daytona was a traditional front-engined, rear-wheel drive car. The engine, known as the Tipo 251 was a two-vales per cylinder, Double-Over-Head-Cam (DOHC) V12 with a 60° bank angle, 365cc per cylinder, a 3.2-inch bore diameter and 2.8-inch stroke, featuring six Weber 40DCN20 twin-choke down-draught carburettors (40mm Solex twin-choke carburettors were used on some versions). With a compression ratio of 9.3:1, the Tipo 251 unit produced 352bhp and the car could reach a top speed of 174mph, and accelerate from zero to 60mph in just 5.4 seconds. For the American version, slight modifications were made – the compression ratio was reduced to 8.8:1 and the exhaust system was equipped with a large central silencer, necessitating visible alterations to the primary pipes. Early Daytonas featured fixed headlights behind an acrylic glass cover, but in 1971 a new U.S. safety regulation banning headlights behind covers resulted in the adoption of retractable, pop-up twin headlights. The five-speed manual transmission transaxle was mounted in the rear for optimal weight distribution, and a race-derived four-wheel independent suspension featured wishbones and coil springs. The excellent weight distribution provided by the rear gearbox transaxle produced a front-engined car of rare balance. The generally accepted total number of Daytonas built is 1,406. This figure includes 122 factory-made spyders and 15 competition cars. 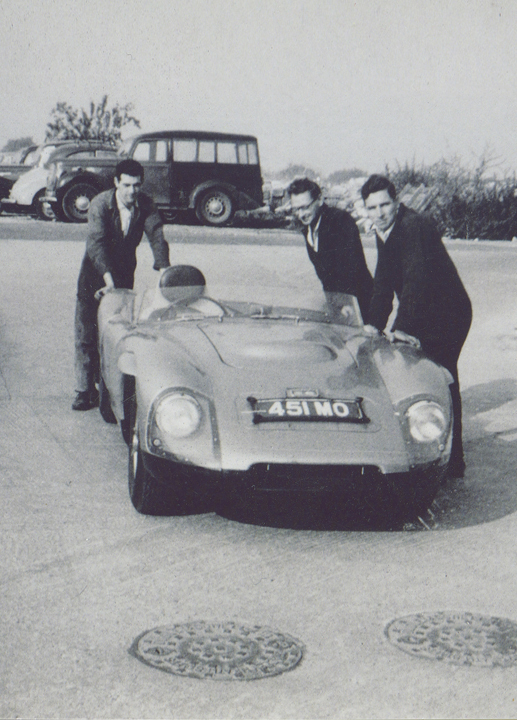 All bodies except the very first Pininfarina prototype were produced by Italian coachbuilder Scaglietti. The first racing version of the 365GTB/4 appeared in 1969 when a prototype aluminium bodied car was built and entered in the Le Mans 24-hour race. The subsequent fifteen official racecarswere built in three batches of five in 1970-1, 1972 and 1973. 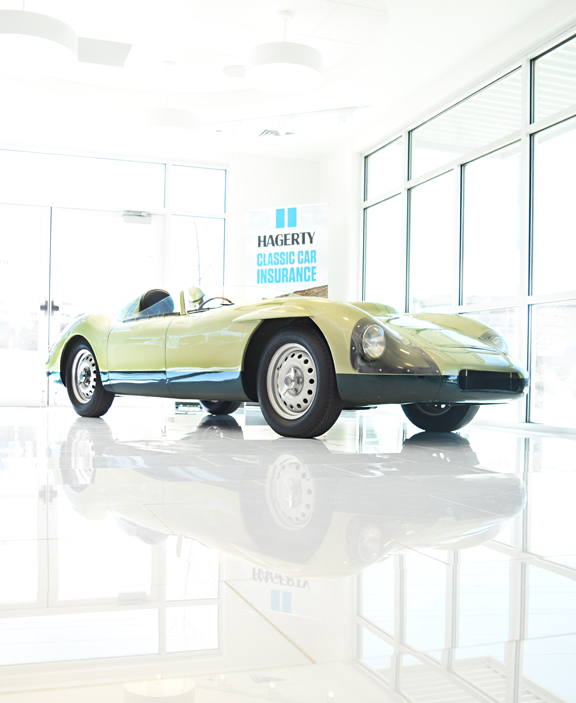 Each featured a lightweight body (by as much as 400lbs) that used aluminium and fibreglass panels, along with plexiglas windows. 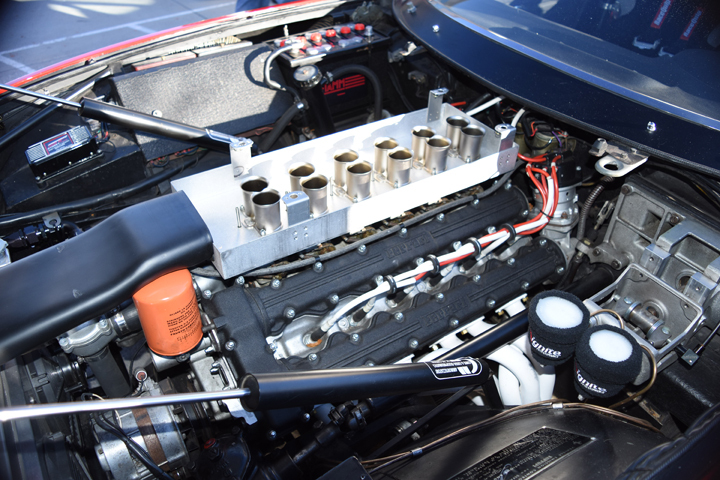 In the first batch of competition cars the engine was unchanged from the road car, but the five 1972 cars had revised powerunits with around 400bhp. 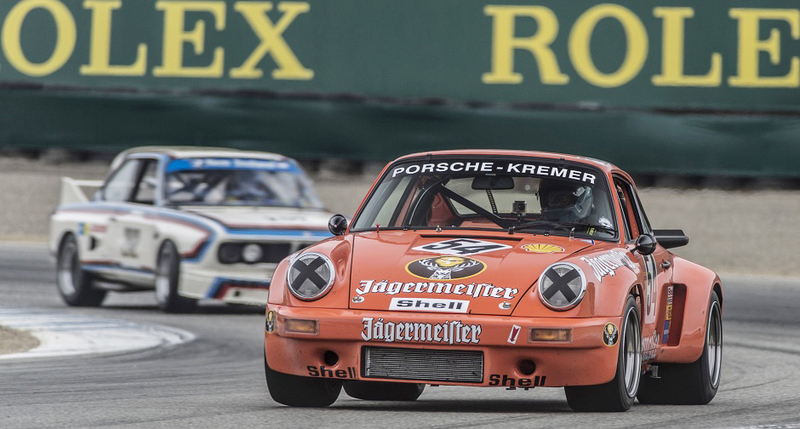 By 1973, the last five ‘race’ cars built had a little over 450bhp. The cars were raced by a range of private entrants and enjoyed particular success in the 24 Hours of Le Mans, including a 5th overall in 1971, followed by GT class wins in 1972, 1973 and 1974. 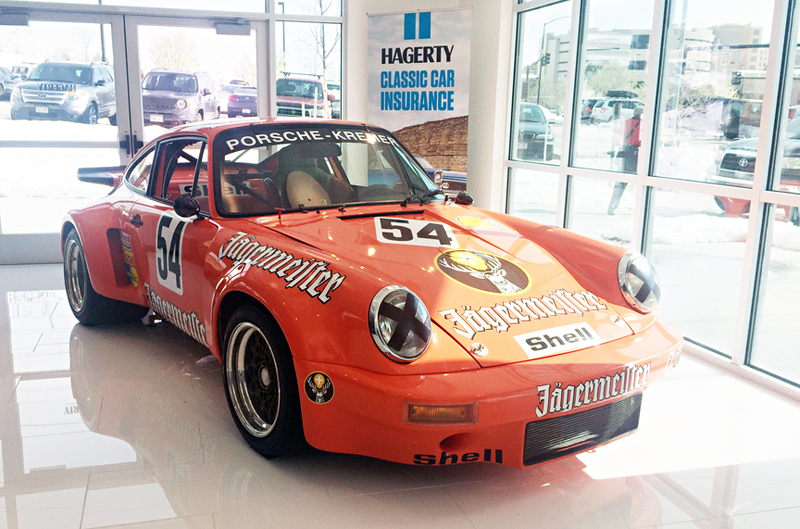 The final major success for the Daytona was in 1979 (five years after production had ended), when a 1973 car achieved a class victory and and incredible second overall in the 24 Hours of Daytona.